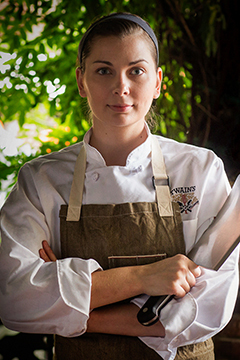 Chef Savannah Haseler had been cooking for over ten years, from fine dining to gastro pub. She received her culinary foundation and formal French training from Le Cordon Bleu and has worked under Chef Jacky Francois, a classical trained French chef overseeing the historic Omni William Penn Hotel, Pittsburgh. With many years of experience Haseler is constantly evolving and actively pursuing new takes on Southern French cuisine. She has cooked for dignitaries, celebrities and all-star athletes from around the world. With her love of community she has helped Twain’s Brew Pub to actively grow their Atlanta Community Food Bank fundraiser, and is partnered with Global Growers, helping create opportunities in sustainable farming in Georgia. Chef Haseler has also partnered with Springer Mountain Farms, Brasstown Beef and Greener Fields Together to also promote buying local.